Family and friends raised questions at a June 18 vigil for Robert White outside his family home. Over 600 individuals from throughout Montgomery County, Maryland, along with six local organizations, have signed and delivered a community letter outlining their concerns about policing in the county. The letter raises concerns in the wake of the shooting death of Robert White, a black man who was killed about one mile from his childhood home in Silver Spring on June 11. He was killed while on foot near his neighborhood, which he walked routinely, according to neighbors. The letter is addressed to County Executive Ike Leggett, Police Chief Thomas Manger, and Councilmember and Public Safety Committee Chair Marc Elrich. In the letter, the community groups and more than 600 signers raise a wide range of concerns about how policing policies impact community safety and trust in the police, especially for black people and communities of color, those who suffer from mental illness, and people with developmental disabilities. Police Chief Manger has responded to the letter and his office has scheduled a meeting on Wednesday, June 27, at the third district police station to address the questions raised in the letter. Elrich has indicated that he will send a representative from his office to attend the meeting. As of Sunday night, June 24, Leggett has not responded to the group’s letter. Two members of the Montgomery County delegation to the Maryland General Assembly, Senator Will Smith and Delegate Jheanelle Wilkins, responded to the letter and indicated they are closely monitoring the incident. Police have not released body camera footage from the scene, as the case remains under investigation by the Howard County State’s Attorney office, under a 2015 agreement between the two counties intended to demonstrate investigative independence. Montgomery County police have released few other details. The officer involved in the shooting is not required by law and has elected not to give a statement to criminal investigators regarding the shooting. Once the criminal investigation is complete, the officer will be required to provide information to police as part of the Department’s internal investigation. In 2017, Montgomery County Police documented 523 incidents of “use of force,” which included use of force in one out of every 37 arrests. There were three uses of deadly force by police in 2017. Two-thirds of all “use of force” incidents in the county involved people of color. Also in Silver Spring (where White was killed), in November 2017, a county police officer shot an unarmed driver who was inside his vehicle. The man, who was not charged with any crime, was injured when the officer’s gun discharged as he used the gun to open a car door while the shooting victim was inside the car. Updated information on how this case was resolved, including body camera footage that was shared with Howard County, as well as findings or discipline related to the officer, have not been shared with the public. Chief of Police Thomas Manger has publicly stated his support for police transparency, and has received awards citing a commitment to transparency and accountability. However, the Fraternal Order of Police has resisted calls to strengthen civilian participation in disciplinary reviews, and the Maryland law enforcement bill of rights, codified as state law, remains a barrier to transparency. Twenty-seven other states make police disciplinary records available to the public, according to the ACLU. White was remembered by family, friends, and neighbors at a vigil held at his home in Silver Spring on Monday, June 18.. Friends remembered White as someone who was always friendly and caring, and said he had a knack for making others laugh. White struggled with mental health issues, according to family and friends. Despite his own struggles, his close childhood friend remembered how well White supported others, checking in daily or every other day with him to see how he was doing, and fondly recalled spending time in his home and playing together as children in Silver Spring. White attended Silver Spring schools Highland View Elementary School, Eastern Middle School, and Montgomery Blair High School. Friends and family are calling for transparency and justice for White. On June 11, Robert White was shot dead by a Montgomery County Police officer. He was just walking through his own neighborhood when accosted by the officer. He was unarmed. And Black. We don’t know the full story of what happened, but we do have a lot of questions. Over 600 county residents signed on to this letter asking some of those questions, and requesting to meet with Chief Manger, County Executive Leggett, and Councilmember Elrich (Chair of the Public Safety Committee). The text of the letter is below, a full version of the letter is available here. As residents of Montgomery County, Maryland, we are deeply concerned about the shooting of Silver Spring resident, Robert White, by Montgomery County police officer, Anand Badgujar, on Monday, June 11th. We are heartbroken that Mr. White was killed by Officer Badgujar. Some of us are neighbors of Mr. White and knew him as a kind and gentle person who enjoyed taking daily walks around our neighborhoods. We are also keenly aware that what happened to Mr. White is not an isolated incident. Across the country, Black people, as well as those with mental illnesses or developmental disabilities, face significant and often life-threatening risks in encounters with law enforcement officers. Montgomery County is unique in many ways, but it is by no means an exception to this troubling pattern. This must change. Law enforcement and county leadership must respond to the concerns voiced by Mr. White’s family, his neighbors and friends in the community, and local activists. We also call upon you to implement systemic reform around MCPD’s practices, protocols, and trainings, particularly as they relate to communities of color, immigrants, people with mental illness, and people with developmental or intellectual disabilities. On behalf of the over 600 people and groups signing this letter, we request a meeting with you to discuss these concerns, detailed below. *MCPD should release the full, unedited body camera footage and all information surrounding the encounter to Mr. White’s family and counsel. *MCPD should provide the public with a detailed understanding of any investigations into Officer Anand Badgujar, the timeframe for decision-making, the entities/people tasked with the investigations, and the complete results of the investigations. *How are MCPD officers trained in de-escalation techniques? How many hours of de-escalation training are officers expected to receive, and how often is the training repeated? Does the de-escalation training include information and protocols about how to defuse conflict and tension, particularly when engaging with communities of color or individuals with mental illnesses or developmental disabilities? *How are MCPD officers trained on interpreting signs of violence and the decision-making process of using force? *Does MCPD conduct random reviews of body camera footage to assess an officer’s performance and identify patterns of behavior? Is body camera footage of an incident – either a successful encounter or a use of force incident – ever used for broader officer training? *How does MCPD define justifiable or reasonable use of force? *What trainings do all MCPD officers receive on non-lethal uses of force to subdue an individual whom they perceive to be combative, or who assaults them? How often do these trainings occur? *How many complaints has MCPD received over the past 5 years regarding any use of force? How have those complaints been addressed and resolved? *When police come from other departments, could they potentially be hired even if they have a record of past complaints? Black people like Mr. White are more likely to be stopped, frisked, and arrested in this country, and they are more likely to face violence at the hands of police officers than whites are. Black people who have disabilities face a double jeopardy. *What specific steps does MCPD take to dismantle systemic racial biases embedded within the department’s organizational culture? How does MCPD help dismantle the individual biases that police officers hold? *How often do trainings occur around implicit bias and systemic racism? When was the last training that occurred? How many police officers go through these trainings each year? Who are the trainers and what are the resources and materials they provide? *What steps does MCPD take to better understand and engage with the diverse communities in Montgomery County? *Do MCPD officers receive training around how immigrants may perceive and engage with law enforcement? If so, how often and who is trained? Who provides the trainings? *Does MCPD track and document interactions between people of color and police officers? How is that data collected, reviewed, shared, and archived? * Do MCPD officers receive training on interacting with individuals with mental illness? If yes, how often is the training conducted? Who does the training and what is the curriculum? *What training do MCPD officers receive in recognizing individuals who may have mental illness, intellectual and developmental disabilities, or other disabilities such as hearing or vision impairment? How often do these trainings occur? Who are the trainers and what are the resources and materials they provide? *Does MCPD work with the mobile crisis service team in Montgomery County? If so, what are the guidelines for engagement and collaboration, especially when there is an encounter between a police officer and an individual with mental illness or disability? How is the mobile crisis team deployed? Do mobile crisis teams always respond with law enforcement personnel, or can they be deployed without law enforcement? *Are the police automatically notified when people call 911 or the Montgomery County Mobile Crisis Hotline? Who makes the decision on whether to send the police out? What protocols exist to guide those decisions? *Do MCPD officers receive Crisis Intervention Training? Do MCPD policies require CIT-trained officers to be dispatched when an officer makes a call for backup? Thank you for your attention to our concerns. We request an in-person meeting with law enforcement and county leadership as soon as possible to discuss our concerns and questions. Please contact Katie Stauss or Laurel Hoa to set up a meeting over the next week. We remain committed to cultivating communities of inclusion and safety in Montgomery County. Today, the Maryland House Judiciary Committee will debate SB 122, the Comprehensive Crime Bill. SB 122 is a dangerous bill that increases penalties and prison time for a number of offenses by creating mandatory minimums. We know that this is an ineffective crime fighting strategy, and one that disproportionately affects people of color. We think that Maryland should be leading the way forward with progressive, compassionate criminal justice reform that respects civil rights and liberty. Instead, SB 122 is leading us backwards. Jerry Kickenson will be representing Montgomery County Civil Rights Coalition before the Judiciary Committee today, testifying in opposition to the bill (read his testimony here). Please take action today to help us fight this dangerous bill. Send an email to your delegates now! The bill would also increase the use of so-called predictive policing tools. This is a disaster for civil rights and civil liberties, putting people under suspicion based on the actions of others. And again, these tools would only reinforce the racism already inherent in our criminal justice system. (BALTIMORE, MD, 1/14/18) — The Council on American-Islamic Relations (CAIR), the nation’s largest Muslim civil rights and advocacy organization, and the Montgomery County Civil Rights Coalition, today jointly condemned the distribution of Islamophobic and homophobic hate literature to homes in Maryland. Stephanie Joseph, a life-long Montgomery County resident and mother of two, was among the residents who received the flyer. “During a weekend when Americans are honoring the legacy and contributions of civil rights icon Dr. King, we should be embracing love and tolerance,” said Joseph, who herself is a Jewish activist and attorney. CAIR said the cartoon-like tracts by the hate group Chick Publications, titled “Camel’s in the Tent,” include bizarre claims that Muslims seek the “conquest” of America by taking over the country “little by little, one city at a time.” Chick has a long history of bigoted attacks on Catholics, Jews, Mormons, Muslims, and other groups. Last year, CAIR condemned distribution of the same hate literature in Maine. “While bigots have the same right to free speech as all other Americans, those who reject hatred and prejudice of all kinds have a duty to speak out in support of the American tradition of racial and religious inclusion,” saidCAIR Maryland Outreach Manager Dr. Zainab Chaudry. We’ve been growing in size and activity, we are up county and down county, fighting to protect our rights and liberties, and those of our most vulnerable neighbors. We’ll be discussing our agenda for the upcoming legislative session in Annapolis, and making other big plans. We need you to be a part of it! Our current committees are Police Accountability; Immigrant Rights; Fighting Islamophobia; Surveillance; Bystander Intervention Training. We are in the process of forming an LGBTQ Solidarity Committee. While attention has been paid to the military-grade equipment that finds its way to local police departments, less emphasis has been placed on examining how police are constantly monitoring (and storing) information they find on social media. Police across the country purchase and use programs to monitor online activity, and Montgomery County is no exception. Gaithersburg and Rockville have spent a combined $50,000 on a service called Geofeedia that allows local police to track posts on social media platforms, including Facebook, Twitter and YouTube, and even identify where some of the posts are originating from. These services rely on algorithms to sift and sort through millions of social media posts in real time, allowing law enforcement to track and discover relationships between social media users. Montgomery County taxpayers have footed the $50,000 bill for social media tracking programs. Now, comes news that County Executive Ike Leggett wants more funding for an initiative to combat gangs that includes keeping a close tab on social media activity (FYI- there will be a public hearing to debate this request). While there are examples of police using these tools to assist with criminal investigations, there have also been a disturbing number of cases where law enforcement have used them to track protests and political movements. This technology has been reportedly used to monitor people protesting the death of Freddie Gray in Baltimore and at Black Lives Matter rallies at the Mall of the Americas. Another company marketing the technology, Media Sonar, suggested police track hashtags such as #BlackLivesMatter and #ImUnarmed. The ACLU has also uncovered that Geofeedia’s marketing materials have referred to unions and activists as “overt threats” and that the company told police its product can help track the “Ferguson situation”. One California police department allegedly used the software to monitor South Asian, Muslim and Sikh protesters. This is a dangerous development that could have a chilling effect on people wishing to exercise their First Amendment rights online and in the streets. Also, there is little information about where and how the data collected by the police is used, stored, or who has access to it. Over 120 people came together on a hot muggy Sunday afternoon in August to learn about our government’s Countering Violent Extremism (CVE) programs in Montgomery County, MD, and around the country. Three young Muslim women, Amara Majeed, Fatema Ahmad, and Ayaan Arraweelo briefed the audience about the way the program has been implemented, how it makes them feel targeted, and how some communities are organizing to fight back. Watch a video of the event here. As a Muslim American, this is what I want to tell you about CVE. Countering Violent Extremism makes me feel criminalized. It makes me feel like because of my religious identity, I will be viewed through the lens of national security. and an everyday, normal American citizen entitled to their Constitutional freedoms last. Ayaan Arraweelo, executive director of the Young Muslim Collective in Minneapolis described the CVE program in that city, which is targeted at the Somali community. Although it is administered through the Department of Justice by District Attorney Andrew Lugar, the program uses a social service model. “Who doesn’t want their kid to have access to mentoring, counseling, and mental health services,” Ayaan asked. “But the program comes with mass surveillance and entrapment.” Many local organizations are hiding their involvement with CVE programs, so Muslim youth don’t know who they can trust, who they can turn to that is not connected to the police or the DOJ. The FBI has a very strong presence, both visible and hidden, in the Somali community in Minneapolis. In addition to FBI agents who identify themselves as such, the community is full of undercover informants who are paid to conduct sting and entrapment operations, and inform on their neighbors. This is dividing the community, sewing suspicion. Fatema Ahmad has been organizing against CVE on two fronts: in North Carolina, where she attended Duke University, and now in Boston, where she is Deputy Director of the Muslim Justice League. The Muslim community in North Carolina was recently surprised to learn that UNC had applied, and been awarded, a grant from DHS to run a “peer to peer” program. Young people (UNC students) with no background or training would make videos designed to stop their peers from becoming terrorists. The grant is troubling on a number of fronts, but primarily because it promotes the idea to the young video makers that Muslims are on a conveyer belt to terrorism, and need to be plucked off it (by one of these videos). This was not a research grant, so there would be no accountability. Fortunately, the grant was cancelled. But the professor is still at the school, and likely to pursue the project. Much of what is happening in CVE is out of the public eye, difficult to find out about, and much of it will be privatized. This surveillance is not anything new. It has been happening for a long time. Particularly against Black Muslims. We need to work with other communities who have faced surveillance or who will face it. The Denver police department has applied for CVE funding, mentioning the LGBTQ community and Black Lives Matter. We can see how quickly this program will expand to other marginalized groups. Promoting Engagement, Acceptance and Community Empowerment, or PEACE. There is also a component that engages with law enforcement, called Youth and Police Initiative Plus, that raises the specter of Somali youth having “unaccountable times and unobserved spaces” as a potential factor in turning them into terrorists. In 2014 the World Organization for Research, Development and Education (WORDE) received a three-year $5 million grant to operate a CVE program in Montgomery County. The program has significant support from the Montgomery County Police Department and the Faith Community Working Group,and the county contributed $244,000 to the effort. Although WORDE claims the program is community led, Amara said it is “not even community informed.” The schools are a primary target, and transparency is a major issue. As in other places, the name of the program keeps changing. The program has also moved from WORDE to the Center on Health and Homeland Security at the University of Maryland. The program has come to be known as the “Montgomery Model,” and like other CVE programs, relies on a list of supposed indicators of propensity toward terrorism. Amara spoke out about how frustrating it is to speak out on legitimate grievances including opposition to US wars in Iraq and Afghanistan, drone warfare, and human rights abuses, and have that viewed through the lens of national security The “Montgomery County Model” is being used around the country to target other communities including LGBTQ folks and Black Lives Matter. We have to be vocal, we have to be loud, we have to be unapologetic in demanding that this program is removed. And it is really gonna be the young people who do this work. And that’s who it needs to be. That’s who needs to be centered in this conversation. You need to get educated… Each community needs to do their homework to investigate how CVE manifests in their community, because it is different from place to place. 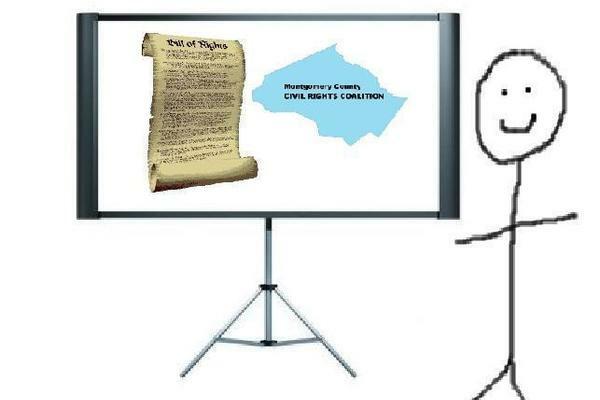 In Montgomery County, the Montgomery County Civil Rights Coalition is drafting an ordinance to prohibit CVE programs in the county. Sponsored by the Resisting Surveillance Collaborative (American Friends Service Committee, Boston Workmans Circle, Defending Rights & Dissent, Intelligent Mischief, and Muslim Justice League) along with the Islamic Center of Maryland, ACLU of MoCo, Arab American Institute, Council on American-Islamic Relations, and the Montgomery County Civil Rights Coalition. This post is co-hosted with Defending Rights & Dissent. How does the national political discourse affect us locally? In regard to hate crimes in Montgomery County, the evidence is disturbingly clear: nearly one-third of last year’s incidents occurred after the presidential election (see chart). That’s a 167 percent increase in the number of hate crimes reported to the Montgomery County Police Department compared to the same period in 2015, according to a report issued by the MCPD. Even more troubling, nearly half of hate-based vandalism reported last year happened at our county’s schools. Since October, more than 35 bias incidents have been reported by or linked to schools, mostly involving vandalism with swastikas, and racial epithets. This trend showed no signs of slowing in 2017. 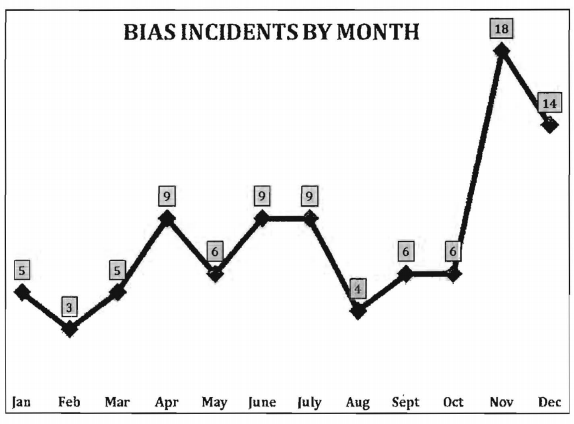 According to the Washington Post, bias incidents across our community have soared more than 80 percent compared with the first six month in 2016. Among them were three noose incidents, an anti-Semitic message aimed at a student, and anti-LGBT vandalism. By any standard, Montgomery County is among the nation’s most culturally diverse places to live, with cities like Gaithersburg, Silver Spring and Germantown regularly topping national lists. The benefits of living in a multi-cultural community are many. A growing batch of research shows that greater ethnic diversity boosts the competitiveness of cities, and spurs creativity and business growth, particularly in underserved neighborhoods. Fortunately, our local leaders recognize the seriousness of the problem. “The Montgomery County Police Department remains committed to upholding the civil and human rights of all people and reducing fear among our residents,” Chief J. Thomas Manger said in the bias report. To assist residents, MCCRC and our allies regularly host training workshops across the county to teach residents how to identify what hate-base incidents or crimes look like, and how to safely intervene, if appropriate. “When people are targeted when walking or being blocked from a bathroom for example, if you don’t get a chance to practice or train for these situations, you may not know how to respond or be confident enough to respond,” says Jim Huang, a bystander intervention expert. To date, nearly 4,000 people have participated in these workshops. Contact us or check MCCRC’s calendar for the next available training. On June 19, Rockville became only the third city in Maryland to pass an ordinance limiting the role of its local police in enforcement of federal immigration law, following Takoma Park in 1985 and Hyattsville earlier this year. After nearly four months of advocacy, supporters of the Fostering Community Trust ordinance,  including many members of the Montgomery County Civil Rights Coalition (MCCRC), erupted in applause after a majority of City Councilmembers raised their hands in favor of the measure, which enshrines an unwritten Rockville City Police (RPD) policy into law. As immigrants and their supporters celebrate this historic achievement, we’re hoping other jurisdictions will join Rockville in passing similar legislation, which simultaneously protects public safety and civil rights. To that end, we offer this after action report as a guide. Our campaign was born November 8, when Donald J. Trump was declared winner of the 2016 presidential election. To our horror, some of his supporters celebrated by committing hate crimes against our most vulnerable neighbors. In its report Ten Days After: Harassment and Intimidation in the Aftermath of the Election, the Southern Poverty Law Center documented 867 hate incidents, the greatest number of which–280–targeted immigrants. Progressive regions like Montgomery County were not immune from this paroxysm of violence: less than a week after the election, a Silver Spring church was vandalized with pro-Trump messages. On December 11, 2016, City Councilmember Julie Palakovich Carr and two other members of the immigration working group for Progressive Women Working Together (PWWT), a Rockville-based women’s group formed after the election to resist the Trump agenda, held their first meeting. At that meeting, Palakovich Carr expressed concern that the RPD’s unwritten policy of limiting cooperation with federal immigrant enforcement actions was no longer robust enough to withstand increased pressure from Washington on our police to take enforcement actions at odds with our city’s values. She agreed to talk to RPD officers and the city’s attorney and research options to shore up the policy, which has served the community well for decades. With one out of three residents born abroad, Palakovich Carr believed Rockville would support the effort to protect immigrants and preserve community policing. By the next immigration working group meeting on January 29, Palakovich Carr presented a draft ordinance she had developed after discussions with police and lawyers and research into similar legislation from other jurisdictions. To gauge support from the community, working group members launched a Change.org petition and a Facebook page. Their belief in Rockville’s values of diversity and inclusion was well-founded; an overwhelming majority of city residents expressed support, with most opponents residing outside city limits. Pro tips: Know your community: your chances of successfully passing legislation are greatest if you live in a diverse, progressive community, where residents experience on a daily basis the benefits of immigrant neighbors. In addition or instead of the online petition, activists could borrow a tactic from Sanctuary DMV and send out volunteers to canvass neighborhoods in the community, collecting signatures on hard-copy petitions in support of legislation while notifying them about other opportunities to support the immigrant community, including know-your-rights workshops, ICE check-in accompaniment, and rapid response teams to document ICE raids and provide support to family members left behind. Find a champion for the ordinance among your elected representatives; in this climate of xenophobia, that could be a challenge; Palakovich Carr and other City Councilmembers received hate mail from across the country, including threats of physical violence. Leaders with that kind of courage may be hard to find nowadays, but they exist. And if they don’t, consider running for office yourself. The ordinance wouldn’t have gotten far without the support of affinity groups, first and foremost MCCRC. At its general meeting on February 7, the organization invited me, as a member of PWWT’s immigration working group, to speak about the ordinance and afterwards help lead a break-out group to discuss how to help Rockville pass it, as well as similar legislation at the state and county level. MCCRC was critical in organizing events in support of the ordinance and publicizing them afterwards, offering advice on management of social media, and simply showing up to testify at numerous City Council meetings. Pro tips: Solicit the support of affinity groups and tap the expertise of more experienced activists. If we had to do it again, we would have made an even greater effort to engage immigrant groups like CASA or United We Dream, whose members have the greatest stake in this kind of legislation and offer the most compelling testimony in support of it. Palakovich Carr introduced the ordinance at the City Council meeting on February 27, and about 75 people showed up at the next meeting on March 6 to voice their opinion, stretching the normally brief public input portion to about four hours. We expected some opposition–we got a preview when opponents launched their own Change.org petition—but we also expected a majority of city residents to support the ordinance, which they did. The opposition, however, was vocal and well organized and required a strong, strategic response. One step we took was to painstakingly review video from the March 6 hearing to compile common misconceptions propagated by opponents of the ordinance and conduct research to rebut them. We published these myths and facts in a blog post, Mythbusting Rockville’s Sanctuary Ordinance, printed them as talking points on the backs of posters and in media handouts, and shared them with members of the City Council. In an earlier post, we discussed our response to organized anti-immigrant opposition and our observation that some news media were more interested in generating heat than light in covering the ordinance. We will provide an update on these topics in a future post. One of our challenges was how to respond to the large contingent of Asian Americans who testified, as immigrants, against the ordinance. Members of Asian/Pacific Islander affinity groups, including API Resistance and Asian Americans Advancing Justice, rose to the challenge, forming a coalition that developed strategies to counter the “good immigrant/bad immigrant” narrative and make common cause with all immigrants. We shared their inspiring statement in an earlier post and will provide more details on this effort in a future post. Pro tips: Conduct opposition research. Listen to your opponents’ arguments and respond to them with all the tools at your disposal, from credible scientific data to moving personal stories. Research press and public records on efforts by other jurisdictions to pass similar legislation to help identify groups and individuals who might show up at hearing to oppose your proposed ordinance. We welcome your questions about our support for Rockville’s Fostering Community Trust ordinance and the advice of others who helped pass this or similar legislation. See also our collection of testimony offered in favor of the ordinance. Although at the outset we referred to the proposed legislation as a “sanctuary” ordinance, we have since eschewed that term, for two reasons: (1) “sanctuary” has no agreed legal definition, and (2) opponents of such ordinances have turned this beautiful word, derived from the Latin “sanctus” meaning “holy,” into a pejorative. 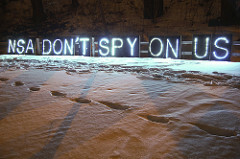 Section 702 of the Foreign Intelligence Surveillance Act enables law enforcement to spy on Americans. It’s time for Congress to act! We know Section 702 powers have been abused. But we don’t know how many Americans have had their nomination scooped up by the FBI. Or the number of times the NSA spied on peaceful groups in Montgomery County, individuals pursuing constitutionally protected political goals, or the former lovers of NSA personnel or government contractors? Congress needs to takes action to fulfill its oversight responsibilities by investigating and determining answers to these questions. The American Civil Liberties Union, American-Arab Anti-Discrimination Committee, Brennan Center for Justice, Color of Change, Defending Rights and Dissent, and NAACP were among the two dozen signatories to the letter. Learn more about Section 702 here.